The OPR deaths and burials are now online at www.ScotlandsPeople.gov.uk, a day earlier than their scheduled release, as revealed yesterday on this blog. Please read the information about the records at the site before doing a search. Users of the ScotlandsPeople Centre system will be aware that there have been problems with the system sometimes slowing down or even freezing due to overload issues. At the moment the system is cleared and re-booted each night to clear the memory but this is not a long term solution because some of the problems still persist. To sort our overload problem, our specialist computer staff need to alter the search facility and make it more efficient. This work should be complete by the Summer 2009. Whilst our IT staff are resolving these problems, there are no resources available to add these records to the system. One of the outcomes of the proposed system changes will that it will be possible to search for a marriage prior to 1929 using both the bride and groom’s name, which will be an improvement. Access to the microfilm for the Old Parish Register deaths and burials will continue to be made available to day search customers. At this stage we can only say that we expect that the records should be available at the ScotlandsPeople Centre by December 2009. Users should be aware however that it is possible to access the external Scotland's People website from a terminal at the Centre (via the Useful Websites link), meaning that it will be possible to do a search through these records for the time being, though not as a part of your £10 daily subscription - you will need to purchase credits for this. The Old Parish Registers are the records which the Church of Scotland kept of births and baptisms, banns and marriages and deaths and burials for the 300 years before the start of the civil registration system in 1855. When the office of Registrar General for Scotland was created in 1855, every parish in Scotland was required by law to deliver to the Registrar General all of its registers of births and baptisms, banns and marriages and deaths and burials up to and including those for 1855. The earliest surviving entries in the OPRs were created in the 16th century. Please note, there is no death or burial entry for Robert Burns (died 1796 in Dumfries). The parish register for Dumfries did not survive long enough for the Registrar General to take it into care in 1855 along with the other OPRs. The Irish Times is celebrating its 150th anniversary, and to commemorate this it is offering free access to its online archive at www.irishtimes.com/150/ until April 5th 2009. There are also free articles on the paper's history at the site. Barry Mill near Carnoustie has formed a steering group to try to urgently identify new sources for funding. The mill, still in operation, is one of the least busy within the National Trust for Scotland's properties and is under threat of closure. It is the last working water mill in Angus, and holds records going back to 1539. For more on the story, visit http://news.bbc.co.uk/1/hi/scotland/tayside_and_central/7965781.stm . The mill itself opens from April 2nd to October 31st, on Thursdays to Mondays, from 12.00 to 5.00pm (1-5 Sundays). For more on the mill itself visit www.nts.org.uk/Property/10/. Twenty pieces of the Lewis chessmen discovered on a beach near Uig in 1831 are to temporarily return to Scotland, where they will be displayed in both Stornoway and Edinburgh. The pieces are believed to be between 800 and 900 years old. For more on the story, visit http://news.bbc.co.uk/1/hi/scotland/highlands_and_islands/7968621.stm. A huge congratulations to Family Tree DNA, which recently received its 500,000th order for a DNA testing kit. Family Tree DNA was founded in April 2000, and was the first company to develop the commercial application of DNA testing for genealogical purposes, which had previously been available only for academic and scientific research. Almost a decade later, the Houston-based company continues to establish standards and create new milestones in the increasingly popular and rapidly growing field of genetic genealogy, whereas other companies have came to the market space looking for the business opportunity, but offering tests of lesser value. As a tried and tested DNA company it is the service of choice for the Guild of One Name Studies (www.one-name.org). For more on the company, and to see the range of products that it offers, visit www.familytreedna.com. The April issue of Family Tree Magazine is on sale, with a great number of genealogical articles to help you on your mission! There are articles on builders' labourers, the military within the Tudor and Stuart periods, bigamy, Royal Naval personnel in the censuses, lesser known sources in the parish chest, Danish ancestors, autograph books and more. On the Scottish front in particular, there is a feature on the top ten resources to be found at the National Archives of Scotland, and yours truly has contributed an article on the role of King James VI Hospital in Perth during the town's massive redevelopment in the 19th Century, it being the feudal superior for the areas of Blackfriars and the Hospital Gardens. Family Tree Magazine is available at your local newspagents - and it does what it says on the tin! The latest issue of Your Family Tree magazine (issue 76, Spring 2009) has gone on sale with the usual goodies within. In addition to an extended news item on the recent Who Do You Think You Are? Live show, Else Churchill salutes the work of the College of Heralds in England, Doreen Hopwood examines records of the poor, and Stephen Thomas looks at colonial ancestors in Australia and the Pacific Islands. There are additional features on property records, DNA testing, grave rubbings, finding Royal Navy ancestors online, a regional guide to Plymouth, and all the usual case studies and regular features. Yours truly also chips in with an in depth article examining the chain of events leading up to the 1916 Easter Rising in Dublin, and its immediate aftermath. On sale now at local newsagents for £4.99. Following on from Billy Connolly, the Famous Scots exhibition at the ScotlandsPeople Centre in Edinburgh features medical scientist Sir James Black, who in 1988 was awarded the Nobel Prize for Physiology or Medicine. Sir James' story can be followed at the centre between March 30th and May 22nd. For more information, visit www.scotlandspeoplehub.gov.uk/scotlands-people-centre/sir-james-black.html and www.nas.gov.uk/about/090324.asp. Join the Voyage of the Vampire for an adventure on the high seas in bygone days: experience pirate-infested waters, parties, antics, foreign sights and tales on board a ship bound for foreign shores. This online journal from April 1846 – January 1847 belonged to George Henry Scott Douglas of Springwood Park, Kelso. He was stationed with the 34th Regiment of Foot (now the Border Regiment) in Corfu. After acquiring a Cutter called the Vampire, he got leave to go on a long cruise with some friends and toured the Greek islands, Athens, the Turkish coast and Istanbul. Twenty years of age when he writes this diary, it is lively and full of verve and joie-de-vivre, providing us with a privileged insight into the life of a young man in an age very different to our own. 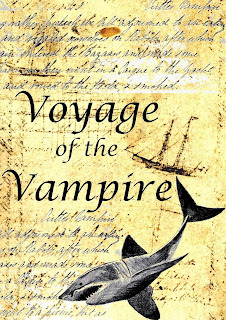 The project launches at www.voyageofthevampire.org.uk on 1st April 2009, with the publication of the first diary entry of 1st April 1846. The adventures will unfold in real time as each subsequent day sees the publication of the next diary entry, plus some songs and poetry penned by Scott Douglas’ own hand. The diary is part of the Scott Douglas collection held by the Heritage Hub, Scottish Borders Archive & Local History Centre. The collection was given to the Heritage Hub by Ian Abernethy who tracked down the Douglas papers to an address in Aberdeen while researching the history of the village of Heiton for his book: The High Toun on the Hill. To coincide with the launch of the Voyage of the Vampire, there will also be an accompanying exhibition at the Heritage Hub on travel and travel writing from the Scottish Borders. The exhibition will feature the original Scott Douglas material, plus other archives from the Scottish Borders Archive collection and will run from 1st April to 19th May 2009. For more on the Heritage Hub at Hawick, visit www.heartofhawick.co.uk/heritagehub. Yesterday I was at the Guildhall in London to witness the official launch of the new London Historical records series from Ancestry (www.ancestry.co.uk). The event was fronted by Time Team's Tony Robinson, and focussed on the release of records digitised from the holdings of the London Metropolitan Archives. The first wave of the release concerns records of the Board of Guardians, who administered London's workhouses, and kept records of all births, deaths and discharges for the institutions (known as 'poorhouses' in Scotland), as well as records for workhouse infirmaries for 'lunatics'. In total, of the 31,475 items held by the LMA on Greater London's Board of Guardians, some 23,000 were registers, now all digitised. If your ancestor went south, it might just be worth a look. Some 70% of enquiries received by the LMA concern these particular records, and hence why they were prioritised in the first release. For Tony Robinson himself, this release had a particular resonance - his great grandmother died in a London workhouse in 1901, which to him brought home how recent these institutions really were in their existence. When complete in late 2010, the Ancestry/LMA collaboration will see the release of some 77 million records from the 1500s to the 1900s, with Ancestry's senior vice-president Josh Hanna claiming that one in two Britons will find a connection. Future releases will include 10,000 Greater London parish registers, as well as bishops' transcripts, poor law records, non-conformist registers, school records, land tax, electoral registers and poll books from 1881 to 1965, wills and more. The entire project will be as monumental in its impact as the English 1901 census release was when it first went online a few years ago. * Whilst at the event, I picked up a press pack, and buried away within that was another announcement concerning the British Army World War One Service and Pension records from 1914-1920. The records have been released slowly over the last year, and the pack states that the total release will be completed by 'late 2009'. John Briden HMCS (Her Majesty's Courts Service) is hoping to get the Probate Calendar Indexes to Wills and Grants, issued since 1858 in England and Wales online. He has put together a short questionnaire and would like to receive as many responses as possible by Friday 27th March. I realise that this is very short notice but if you are able to help by responding to John it would be appreciated. Q1. If the probate calendar was available on the internet, would you use it? Q2. If you would use it - how often would you use it? Q3. What probate information would you be interested in seeing online, and why that particular information? Q4. Would you like to order copies online, and be prepared to pay for them online? Q5. Would you prefer to access the calendar online, but order and pay for copies by post, or by telephone? Q6. Would you be prepared to pay a premium to the fee, in addition to the normal cost for a more immediate service? If you have English or Welsh family history connections, please do contribute to the questionnaire - I'm sure we all appreciate how effective and useful the online wills are at ScotlandsPeople! The National Archives of Scotland has a fascinating account on its news site of the arrest of 40 members of Lerwick Post Office on November 1st 1914. All were sent to prison for a week, detained under two articles within the Defence of the Realm Act, and eventually released on November 7th. None of them had a clue as to why they had been incarcerated. To find out why, visit www.nas.gov.uk/about/090320.asp! Here's an update from the hottest new genealogy website in town, Ancestral Atlas - www.ancestralatlas.com. In partnership with Past Homes Limited, any Ancestral Atlas subscriber will soon be able to gain 1 years free access to Past Home's online map browser showing their collection of the First Edition 6 inch scale Ordnance Survey maps of Ireland. These maps, originally surveyed between 1829 and 1843, cover the whole of Ireland and show individual buildings, fields and farmsteads from that period. The map browser allows you to pan and zoom across all 32 Irish counties and to order gallery quality prints or downloadable extracts in PDF format. The normal price of an annual subscription for this service from Past Homes is US$25. The system will soon allow you to import data associated with events, people, family relationships, notes and source citations. Initially, imported events will not be shown on the map - instead, they will be colour-coded in the Event List so that you can easily identify them and position them manually. You'll also be able to remove all data imported from a GEDCOM file so that you can import an updated version. This will help you to locate imported events. Where multiple matches are found, you'll be allowed to choose the correct location or specify a new one. Whilst viewing data in England or Wales, subscribers will soon be able to switch the map view from the modern-day Google map to an historical (1893 - 1903) map. Don't forget that we've set up a forum at: http://groups.yahoo.com/group/ancestral_atlas - please join to view the latest messages or discussions regarding the site and its functionality. Basic membership is free, with various subscription levels thereafter, but this site is definitely worth keeping an eye on. The Clergy and the Clearances: The Church and the Highland Crisis 1790-1850 is an excellent book on the subject of the Clearances by David Paton. David is actually a cousin of mine, and I received a copy in the post this morning from his uncle, a former archdeacon of Canterbury Cathedral, who enthused about it no end on the phone the other day! The book was published in 2005 by John Donald (an imprint of Birlinn) and I've been absorbed by it all afternoon. Yup, I am completely biased, but it is a great read! The Scottish Mining Museum has been pledged £1.3 million from the Scottish Government, following the recent withdrawl of funding by Midlothian Council and Historic Scotland, as reported on this blog in February (Scottish Mining Museum - Funding Crisis). A series of family history workshops will be held at Bayanne House, Yell, Shetland Islands, on each Saturday and Sunday in May, June, July, and August, running from 10.00am-12.00pm and 2.00-4.00pm each day. There is a website for Bayanne House at www.bayanne.co.uk, and a new dedicated page dealing specifically with Shetland ancestry at www.bayanne.info/Shetland. For more information telephone 01957 744219 or 07788 852675. The University of Aberdeen will become a centre of expertise and learning in conserving rare historic books and manuscripts, thanks to a multi-million pound gift from an American benefactor.US philanthropist Dr Loretta Brennan Glucksman is making the personal gift of three million dollars towards a purpose-designed specialist conservation studio adjacent to the new University library. The University is the custodian of extensive collections of historic books, manuscripts, maps and other items. A major purpose of the new £57 million library is to provide ideal conditions to safeguard and showcase these priceless items, and make them more accessible to students, researchers, and to the wider public through exhibitions, readings and other public events. The Glucksman Conservation Studio will build further on this ambition by providing a specialist facility to undertake, promote, and teach the latest techniques in conserving material originally created many hundreds of years ago. The studio will also promote interest and learning in the art of conservation for many groups in the community. The Studio will become a centre of expertise in book and paper conservation providing services to archive holders across the North East of Scotland and beyond. The University is in discussions with regional and other heritage agencies to establish partnerships. The ninth Fife Family History fair will take place on Saturday 3rd October 2009 at Rothes Halls, Glenrothes, from 9.00am to 5.00pm. There will be an exhibition area throughout the day, and a range of speakers on various topics including Billy Kay, Dr. Norman Reid, Jenni Calder and Dr. Marjory Harper. Tickets for the day are £17.50, or £3 for those just wishing to attend the exhibition area. For more information, visit www.fifefamilyhistoryfair.org.uk. Bronze plaques listing the names of 528 victims of the Clydebank Blitz of March 13th and 14th 1941 have been unveiled at Old Dunnotar Cemetery's Blitz Memorial. For more on the story visit http://news.bbc.co.uk/1/hi/scotland/glasgow_and_west/7941641.stm. The Red Cross has announced that it is to digitise some 20 million records relating to casualties of the First World War, from a collection recently discovered in Switzerland by historian Peter Barton. The project is hoped to be completed by 2014, in time for the war's 100th anniversary. For more on the story, visit http://news.bbc.co.uk/1/hi/uk/7940540.stm. Barton has been to the Red Cross to research soldiers buried at Phoenix Wood in the aftermath of the Battle of Fromelles, in 1916. The Commonwealth War Graves Commission has now announced that the soldiers, buried in the wood in several pits by the Germans following the battle, are now to be recovered by Oxford Archaeology and reinterred in the first purpose built war cemetery by the commission in over 50 years. For more on this, visit www.cwgc.org/news.asp?newsid=98&menuname=&menu=sub&view=yes&id=13&menuid=0&s_month=&m_name=. We've put more than 110,000 Royal Marine service registers online for you to search and download. If your relative joined the Marines between 1842 and 1936 you may be able to find them here. You can search by surname, first name and date of enlistment. The registers can tell you the ships that your Marine served on, medals they were awarded, details of their conduct - or misconduct - and more. To search the registers, visit www.documentsonline.com. I had an interesting time this morning at a media launch for the new Burns Monument Centre in Kilmarnock, East Ayrshire, which has been built in the aftermath of a serious fire that seriously damaged the town's memorial to Robert Burns in 2004. Now beautifully restored, to the tune of £5 million, it has been enhanced as a purpose built facility to house the local registrar's office, a conference room, a venue for civil weddings and ceremonies, and of course the local archive and family history centre. Within the centre there will be free access to OPR records for Ayrshire, newspapers, poor relief records, documents and photographs, burial records and more. A feature advertised on the website is however, apparently not going to be available after all - access to DIGROS, the records system formerly used at the GROS in Edinburgh, through which access can be gained to pre-1855 OPR records and civil registration records to the present day. Instead, users can purchase 100 credits for £10 for the ScotlandsPeople website (roughly about half the cost you would pay at home), and top ups thereafter as required. This will I am sure be adequate for those starting off on their family history research, and all is not lost, as this is intended to be a temporary measure. The site is hoping to be the first in Scotland to gain access to the new private network version of the new computer system that has just been installed at the ScotlandsPeople Centre in Edinburgh. My understanding is that when this happens, hopefully by June, users will then be able to pay out a flat fee of £15 for a day's access, which definitely beats a two hour trip to Edinburgh each way! The centre will be open as of next Monday, 16th March, from 9.15am to 4.45pm each day except Friday, when it will close an hour earlier at 3.45pm. A new website outlining the centre's facilities is available at www.burnsmonumentcentre.com. A very welcome development for anybody researching their family history in Ayrshire! Today images of the original 1881 Scottish census records are being made exclusively available on the website www.scotlandspeople.gov.uk, the official Government source of genealogical data for Scotland. The census images chart the lives of the 3.7 million Scots living in Scotland on the night of 3 April 1881. Each census record includes the name, age, address, occupation and relationship to the head of household of every citizen. ScotlandsPeople already contains the census of 1841, 1851, 1861, 1871, 1891 and 1901. The new images of the census records will enable family historians to more easily trace their Scottish roots and the digitised versions of the original documents can also provide a keepsake of their ancestors’ lives. This census offers a wealth of information about our ancestors’ lives in Scotland in 1881, a year when William Gladstone was Prime Minister of Great Britain, a treaty was signed ending the first Boer War, Alexander Fleming, the inventor of penicillin, was born in Ayrshire and Queens Park triumphed over Dumbarton in the Scottish Cup Final. In addition to the high-quality images of the census entries, transcriptions of the census records are also available on the ScotlandsPeople.gov.uk website and the census is fully searchable by surname. "The Guga Hunters of Ness"
Launch of Flora MacDonald's new book "Cocoa and Crabs - A Hebridean Childhood"
For more information visit www.theislandsbooktrust.com. As a dedicated fan of Family Tree Maker 2006 (though not 2008 or 2009! ), I don't often find a family history programme that has the same flexibility or enough useful features to tempt me away from The Generation Network's product. However, I've just had a pleasant surprise in the form of RootsMagic version 4, from S&N Genealogy (www.GenealogySupplies.com). The programme is extremely easy to use, has all the necessary charting functions, source citation fields, narrative report functions and more. The platinum edition, worth £49.95 comes with many useful CDs, including Scottish Landowners 1872-73, Irish Landowners 1876, an Armory of England, Scotland & Ireland from 1894, and English and Welsh landowners from 1873. There is also a 90 day subscription to TheGenealogist.co.uk which is increasingly becoming more useful to those with Scots ancestry. The product was launched at WDYTYA Live and should soon be available online from www.rootsmagic.co.uk. The Clan Grant Society is to plant trees at Dundreggan Estate to celebrate the 500th anniversary of it first receiving a barony from James IV. The Burns Monument Centre in the Kay Park, Kilmarnock, is a unique ground-breaking development in Scotland. The centre, which opens its doors to the public on Monday 16 March 2009, houses registrars, librarians, archivists and resources under one roof for the the very first time creating a first class facility for family and local history researchers. Digital Imaging of the Genelaogical Records of Scotland's People (DIGROS) online service allows viewers to access the full range of family research tools including births, deaths and marriages in Scotland from 1855 and the Old Parish registers from 1553-1854. In another first for Scotland, the centre also houses the only three dimensional digitised representation of Burns' most famous work, 'Poems, Chiefly in the Scottish Dialect', which was published in Kilmarnock by printer John Wilson in 1786. This allows visitors to see the Kilmarnock edition exactly as it was printed. This project was developed in collaboration with the National Library of Scotland. Set in the 30 acre Kay Park the centre also makes a beautiful venue for weddings and other special ceremonies, including civil partnerships and naming ceremonies. The Robert Burns suite can take up to 85 guests and the courtyard, which houses the original Burns statue from 1879, makes an ideal location for photographs. I'll be attending a media launch for the new centre within the next few days, and will post pics and a review when I return - good to see such a great resource finally up and running just down the road from me! Peter Christian's newly expanded fourth edition of The Genealogist's Internet book is now on sale - and we get a nice plug in the news section, with a half page size screengrab from this blog. So there you have it - we're official! The book is available from The National Archives (www.nationalarchives.gov.uk) for £14.99. ITV has confirmed that the Genes Reunited website is to be placed up for sale as part of the Friends Reunited group, which the television giant purchased in 2005 for £120 million. The site, which has recently been considerably revamped with new added features, is now up for tender, and an ITV press spokesperson has confirmed to me that a couple of approaches have already been made with regard to its potential purchase. How this will impact on users of GR has yet to be established. Will Genes Reunited be put up for sale? The broadcaster ITV is in serious financial difficulties, with further losses of advertising revenue and a pension deficit. It is about to announce its annual results, and there are fears that it may be forced to slash jobs and to sell the Friends Reunited website. Will Genes Reunited (www.genesreunited.com) be included if this happens? A BBC story on ITV's current woes is available at http://news.bbc.co.uk/1/hi/entertainment/7922664.stm. UPDATE: 4 MAR 13.00: Friends Reunited is definitely up for sale, still no word on Genes Reunited - see http://news.bbc.co.uk/1/hi/business/7922770.stm. GR is currently referring all enquiries on the subject to ITV. The latest issue of Discover my Past Scotland has just gone on sale online at £2.50 with some more great Scottish content. John Hannavy shows how to date old family photographs; Anthony Adolph explores how to bring your Scottish family history to life; Michelle Higgs describes how to access and use Scottish hospital records; Emma Beeston looks at the brewing and distilling trades; Mary Richmond looks at the town of Paisley; and yours truly examines the story of Scottish civilian POWs interned in Germany in the First World War. There are also the usual regular features including all the latest Scottish news, the latest products of use to the Scottish family historian, expert Q&A, events listing around Scotland and the monthly Bygone Days feature. Only £2.50? You're having a laugh mate...! This is not a Scottish story, but I feel duty bound to carry it, as my cousin Carolyn is a member of the Richard III Society! Having caught up with the society at the Who Do You Think You Are? Live event in London, the organisation revealed that it has just published the Logge Register of Prerogative Court of Canterbury Wills from 1479 to 1486 in a two volume set, priced £35. I had a look at each book and they are a wonderful publication - each will is written in Latin, transcribed and translated. The first will recorded is that of John Logge, a London woodmonger, and hence the name of the collection. The volumes are useful for those wishing to practise their palaeography, as they can be compared to downloads from the National Archives' Documents Online site, and in the near future the rapidly growing collection on the Genealogist website from S&N. For the serious social historian, it is much cheaper to buy the volumes than the equivalent downloads online. For more information visit www.richardiii.net. 'Roots' author Alex Haley has been shown to have had Scottish ancestors, thanks to a DNA test performed through Ancestry.co.uk. At the Who Do You Think You Are? Live show at London Olympia on Saturday, his nephew Chris Haley was reunited with a distant Scottish cousin, June Jaff-Black. The full story is available at http://news.bbc.co.uk/1/hi/scotland/7917605.stm. 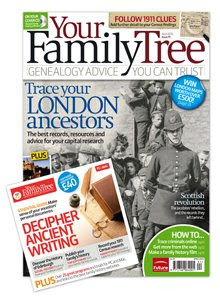 The latest Family History Monthly issue (168, April 09) is now on sale, with the usual detailed features. There are articles on Easter cards, life in the 1930s recession, barging life on Britain's canals, WW2 POWs, the Norwich census of the poor from 1570-72, the English county of Rutland, and more. Yours truly has an article explaining the 1911 census for England and Wales, and a case study on a family connection to the Irish Civil War of 1922. The latest edition of Your Family Tree magazine (75, April 09) is now on sale. As well as articles on tracing London ancestors, the 1911 census, tracing criminals online, getting started with the internet, and the Lothians, yours truly has written a history of the Jacobites and Culloden, and a case study looking at Paton Street in Brisbane, Australia. All the usual regular articles are also there, including the news, the regular projects pages and a data CD. I finally got back to Largs at midnight last night from four days in London for the Who Do You Think You Are? Live show, and had a great time, with lots of wonderful discoveries made. I was helping Bob and Liz Blatchford on their stall - the couple publish the Family and Local History Handbook (www.genealogical.co.uk), which we were selling fast and furiously on the stall. Whilst the new edition is still some months away, the couple had decided to place all previous editions on a CD edition, and to say it went like hot cakes would be an understatement! A huge thanks to Bob and Liz for their hospitality and generosity, and above all else, the great craic! There was a great deal of Scottish material there, more than I expected considering that no FHSs were present from north of the border. In addition to the universities of Strathclyde and Dundee, ScotlandsPeople and NAS were present, as was the Gathering 2009 and a professional genealogy firm. With Saturday being 'Scottish Saturday', there was also the stirring music of Celtic Pride, all the way from Glasgow, including that well known traditional pipe tune, "We Will Rock You"! However, there were also some useful finds, including the fact that Deceased Online (www.deceasedonline.com), launched several months ago, has finally uploaded new data, including burials information from Angus for the civil registration era - these were uploaded on servers at the venue, and will be going fully online in the next week or so. World Burials Index (www.worldburialindex.com) also launched its website, which includes burials at Edinburgh's Greyfriars churchyard. Other finds included the fact that the Commonwealth War Graves Commission is about to build its first memorial since WW2, to commemorate almost 400 souls lost at Fromelles in WW1; the fact that the National Archives of Ireland has a MAJOR project on the go which may be online by the end of this year; the fact that FindmyPast is now working on the Chelsea Pension documents from TNA; plans for the future of the Who Do You Think You Are TV series from Alex Graham, the Glaswegian head honcho of independent television production company Wall to Wall; and much more. There will be a full Scottish write up in a forthcoming edition of Discover my Past Scotland - but here are a few pics in the meantime...!